Loud rasping hiss. Does not hoot like a typical owl. Description: Sexes similar. Females are darker in color than males. Distinctive white heart-shaped face ringed with tan; dark eyes. Back is light tan, and underparts vary from white to cinnamon. 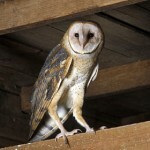 Food: Rats are the favorite prey of Barn Owls, but they will also eat many other rodents. Habitat: Found in open to semi-open habitats where small rodents are plentiful. Hollow trees, old buildings, or caves are necessary to provide roosting and nesting sites. but seems to be more common in southern Nebraska. 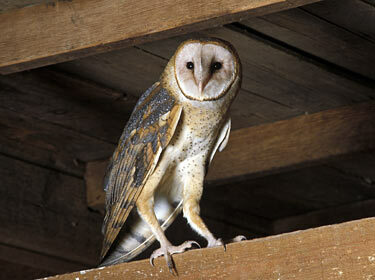 Fun Facts: Barn Owls are one of the few birds species with females that are more showy than the males. Females have a more reddish and spotted breast.